Plans for the rescued 96? A Baja style racer. 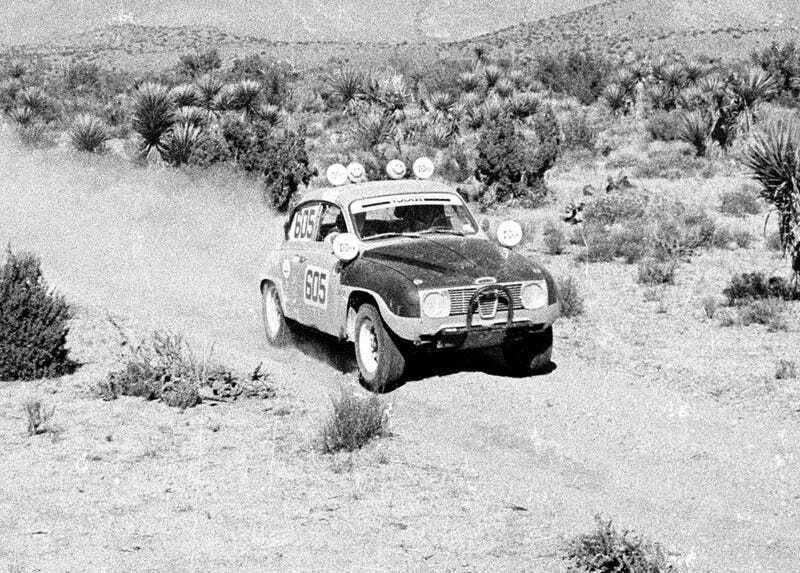 It’s more or less forgotten now, but Saab was once a big name in Baja off road racing. Scoring victories in three Baja 500 races (including one outright, overall win) and one Baja 1000 during the early 1970s. The 96 we (Ttyymmnn and I) picked up is a ‘68 that was last registered in 2005, and is in remarkably rust free and original condition. It has been involved in a light front end collision so will need a minimum of straightening and welding up front before it will fit together again, but overall in decent shape. Currently features some speed holes that I plan to reduce, probably to 0. I don’t think I need speed holes. Most remarkably, the interior is original. Cloth seats are in excellent shape. I’ll see if I can sell or trade these, because the interior will be coming out. The Baja cars were all stripped out to save weight (including windows - side windows will be coming out of this car too). Suspension arms will be reinforced, and dual shocks added to the front suspension. I’ll do a slight 1" lift with spacers over the springs, and ultimately when I find some money, have centerline wheels made for it. I will not be doing the over-roof exhaust because I want to keep it street legal and need to pass inspection in Texas. The wagon - I’m actually seeing if any Lemons people would be interested in it. Now that I’ve had a chance to really look it over, I see it would be a solid candidate for restoration or modification, but I don’t really have the space for it, and getting some cash for it would get me kickstarted on building the Baja Saab 96. If I can’t find the right buyer, I’ll do my best to find some place around Austin I can store it for free, because I’d love to come back to it and make it run if I just had the time and money for it.